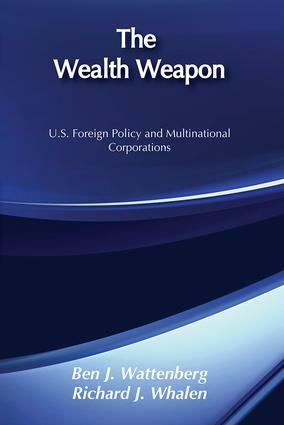 When President Carter responded to the Soviet invasion of Afghanistan by slapping an embargo on U.S. grain shipments to the U.S.S.R., he used ""the wealth weapon"" to defend American strategic interests and human rights, as authors Ben J. Wattenberg and Richard J. Whalen pro­pose in this book that breaks new ground in analyzing U.S. foreign pol­icy.Writing from their different per­sonal perspectives (as a liberal Demo­crat and a moderate Republican re­spectively), this pair of partisan ac­tivists offer a lively, balanced set of arguments, pro and con, for an activist U.S. foreign policy. They and a cast of invented characters representing op­posing viewpoints debate whether U.S. foreign trade and investments and American multinational corporations should be used to pursue national goals and objectives, especially in dealing with the communist nations.The authors argue that the post-Vietnam reduction of U.S. political influence and military strength over­seas gives future presidents little choice but to use the largely exploited economic strength and wealth-creat­ing ability of America to protect vital interests abroad - just as President Carter felt compelled to do on an ad hoc basis after the Soviets took over Afghanistan. They call for a consis­tent, long-term use of ""the wealth weapon"" in close coordination with U.S. allies and trading partners.As veteran political analysts and so­cial critics, the authors take a fresh, provocative and informative look at a phenomenon too often left to dry-as-dust economists: the role in the world of giant global corporations whose re­sources often dwarf those of nation-states. As they declare, the authors set out to write the first truly readable (and even enjoyable) book about multina­tional corporations - and they have succeeded amid a world crisis when their timely message anticipates to­morrow's headlines.